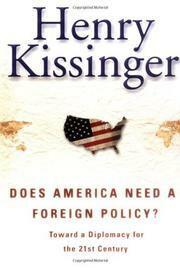 The question is rhetorical: this is Henry (“Have foreign policy, will travel”) Kissinger, after all. Here, he takes America to task for its lack of vision in foreign policy, and maps the playing field for diplomatic consideration. Richly opinionated and controversial: a strong addition to the contemporary debate over America’s direction in the new century.